Have you ever cooked using dittany of Crete, Greek mountain tea or wild rose? This book presents an original venture that aims to improve our wellbeing: Far from being simply extras, aromatic-medicinal plants should become the stars in our everyday diet and our domestic environment. This book approaches the scientific knowledge in a simple manner, enriches the Mediterranean diet, opens up new culinary horizons and gives a new spark to the cultivation of aromatic-medicinal plants. "I would like to call attention to an excellent new book by colleagues from Greece. It is full of information about these plants, great recipes and even how to cultivate these herbs yourself. These herbs and plants are an important component of the Mediterranean Diet." "Everything you ever wanted to ask about Mediterranean herbs but no one could give you the answers with accuracy, their history of use, properties, effects, their proliferation and cultivation are all found in this book that you can almost smell the scents it encloses while reading it like a novel"
"As soon as you finish reading it you will realize that you have an appetite twice as big as the one you had before and you will want to put together your own little garden even in the small terrace of your building. You will also feel the urge to go in the kitchen and immediately start cooking scented dishes that no one else has ever suggested before"
"The ancient herbs; medicines used before the development of contemporary medicine; scents coming from the primordial Greek horizon, find their second chance to be spread again through this book. 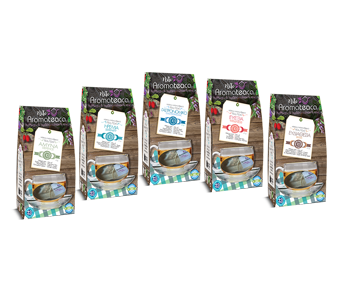 New culinary ideas put them back in our cooking pots combining new flavours with simple recipes which have a “beneficial” relish for you as well. “Beneficial” that is valid, “beneficial” that matters"
"… It’s time to praise new plants for seasoning our food such as dittany of Crete, marjoram, and winter savoury…"
"… dozens of recipes in this book; when I tasted them, I recalled the summer landscapes dominated by the scents of dittany, mint and whorled savoury"
"A wonderful book with rich contents, full of dense knowledge and new ideas; when I tasted the recipes, I held it in my arms as a valuable treasure, close to the knowledge I inherited by my mother and trusted for so long …"
"Reading this book makes you feel like spring can last all year round; an uncommon book with documented knowledge, a key to unlock with safety the doors of the aromatic heaven of Greece…"
This book presents an original venture that aims to improve our wellbeing: Far from being simply extras, aromatic-medicinal plants should become the stars in our everyday diet and our domestic environment. Historical information and basic biological data for 15 aromatic-medicinal plants of the Greek land and the Mediterranean region are given, and their components and properties are provided, while special recommendations/ precautions are made, along with reviews of their nutritional use. Moreover their aromas and flavours are described and small secrets about their utility are unveiled. In total, 75 creative recipes (and variations) with accompanying beverages are given, 52 menus are indicated, 11 drinks and 5 original blends of plants for making beneficial beverages are suggested. Lastly their cultivation and propagation and their maintenance is described in a practical manner (basic advice on their care in the field, the garden or on the balcony). (or in a couple of days)! Order two books at a price of €49 (including domestic express)! (€39 including shipping) and get it within 5 days! Order two books at a price of 69€ (including shipping)! and get it within 5 days! Order two books at a price of €89 (including shipping)! To send the book as a present to another recipient DO NOT use the website's order form; instead send us an e-mail (info@aromagardenbook.gr) with your request (include the recipient's address) and we will inform you about the procedure. An e-mail via PayPal will be sent to you in order to pay for your order. After years of independent career routes, individual searches, thoughts, testing efforts, experimentation and research, we are finally pleased to share our endeavour with the general public. 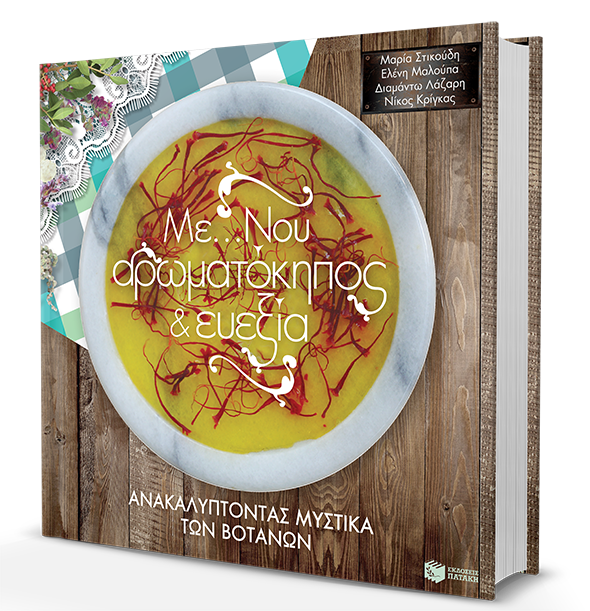 The aim of this book is to acquaint the reader with some of the aromatic-medicinal plants of Greece and the Mediterranean region in order to use them in everyday life in many beneficial ways (cooking, tea making, gardening and landscaping). The selection of plants in this book was not accidental. We have chosen to present aromatic and medicinal plants included in the European Pharmacopoeia because they have integrated scientific monograph approved by the Committee on Herbal Medicinal Products (HMPC, on behalf of the European Medicines Agency i.e. EMA) such as lemon balm, medicinal sage, fennel, dittany of Crete, marjoram, Greek mountain tea, mastic from the Chios Island (Greece. Additionally, we included plants with well-established use of their edible parts (such as Cornelian cherry dog wood, rock samphire, carob), and other plants that are well known for their long standing traditional use (capers, wild rose or dog-rose, saffron Crocus, sumac or rhus and winter savoury). For all these wonderful plants we believe that we have created a multifaceted book for you to use and enjoy! 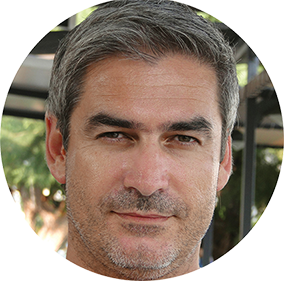 Dr Nikos Krigas is a biologist specialised on systemamic botany and plant taxonomy. His research interests are focused on biodiversity and human activities, plant ecology, conservation of Greek native plants and the sustainable utilization of the plant resources of Greece. He is an honorary member of the Association of Medicinal and Aromatic Plants of Greece. He works in the School of Biology of Aristotle University of Thessaloniki, Greece. 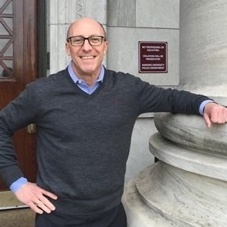 Hehas been adjunct Lecturer at the Faculty of Agronomy, School of Agricultural Crop Production and Rural Environment of the University of Thessaly and has taught as professor at the Faculty of Agricultural Production of ATEI in Thessaloniki and at the American College of Thessaloniki. Under his supervision, several students have completed their bachelor theses in ATEI of Thessaloniki and he has also co-supervised MSc theses. 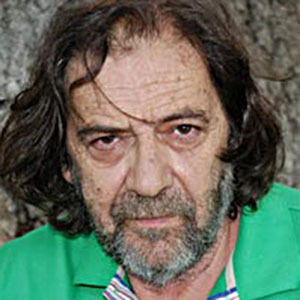 He has also worked in the Balkan Botanic Garden of Kroussia – Laboratory for the Conservation and Exploitation of Native and Floricultural Species of the Hellenic Agricultural Organization Dimitra. His publications include a monograph (doctoral dissertation), several articles in international journals, publication of books and book chapters, numerous scientific studies published in books of international and national conferences and many articles which were aiming to raise public awareness. He has taken part in many research programmes, has been invited as a delegate in many workshops or seminars. He has also been tutor in activities regarding the training of students and professors of the primary and secondary education. He has taken part in the completion of standardized datasheets for several Special Areas of Conservation of the NATURA 2000 network in Greece. He has participated in scientific committees of national and international conferences and has been areviewer for international scientific journals. He shares his passion for cooking with his family, friends and associates. He has taken active part in many tasting events with aromatic plants organized by the Balkan Botanic Garden of Kroussia. He loves to experiment with new ingredients and try new flavour combinations. He is married and has one girl. Maria Stikoudi was born in Dusseldorf of Germany and grew up in Thessaloniki where she still lives. She is a foodblogger. She works at the Institute of Plant Breeding and Phytogenetic Resources of the Hellenic Agricultural Organization Dimitra as an administration assistant and is responsible for organizing events and public relations. She has played a significant role in organizing the catering for many celebrations-events that took place in the Balkan Botanic Garden of Kroussia (BBGK) during workshops and scientific meetings. She has also taken part in many aromatic plant tasting events where Greek and international scientists participated as well. In addition she has cooked on TV shows such as “Real-life scripts”, “Land of Macedonia” and “Good afternoon” (all of which were filmed in BBGK). 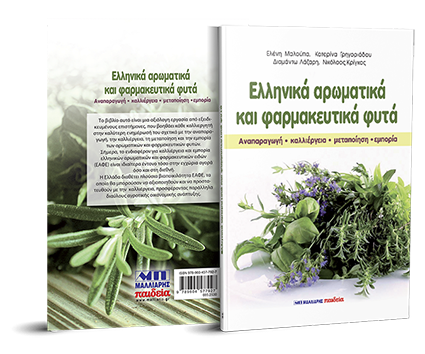 In the book she has written with Dr Eleni Maloupa “Aromas and tastes from the Botanic Garden” she cooked recipes enriched with the graceful aromatic plants of Greece. The book was published in the framework of a specific programme and was distributed for free. It was out of stock very shortly. In the book she wrote with Eugenia Karagiannidou “Diet and flavor” published in 2013 by Ziti Editions she cooked healthy and tasty food (with count of calories) for children of different ages and performed the photography of the dishes. In September 2011 her cooking “Pasta with split peas and dog-rose” earned the 1st prize in a cooking contest that took place in the island of Santorini, Greece. In November 2011, she took part in a contest on the most representative recipe of Thessaloniki and was distinguished among the top five cooks(“Chickpeas with chicken”). She has published over 150 recipes in several sites on the internet about organic products and related to advice for young mothers. She loves Greek traditional recipes, Greek local products (especially the ones with designation of origin) and she makes use of them according to their season. All these and many more are included in her foodblog (aromatikesistories. blogspot.gr). Dr Diamanto Lazari has graduated from the School of Pharmacy of the University of Athens and is holder of the License to Practice the Profession since December 1989. She has conducted her Doctoral research in the laboratory of Pharmacognosy of the School of Pharmacy of the University of Athens. She has worked for two years (1999-2001) in Evangelismos General Hospital (Athens). From September 2001 to February 2003 she was a holder of the research fellow position as an Assistant Professor in the Department of Biological Applications & Technologies of the University of Ioannina, Greece. 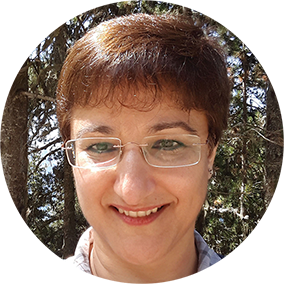 In 2003 she took over the position of Lecturer in the Faculty of Pharmacognocy-Pharmacology of the Department of Pharmacy in Aristotle University of Thessaloniki, in 2010 she took the position of Assistant Professor and in 2016 the position of Associate Professor. She has been retrained in workshops abroad (University of Valencia-Spain, University of Florence-Italy). She has numerous publications in international scientific journals, she has published books and numerous scientific studies in books of international and national conferences. She has taken part in various research programs either as a scientifically responsible or as a member of the research team. Her research activity is focused on the pharmacognostic study mainly of the Greek native plants, the isolation and structure determination of natural products with bioactive properties (terpenes, polyphenolic compounds etc.) as well as the study of essential oils. She is a member of Greek and International Organizations. She is or has been supervisor or member of the advisory committee of several MCc theses and doctoral theses. She was also member of several evaluation committees of MSc and doctoral theses. 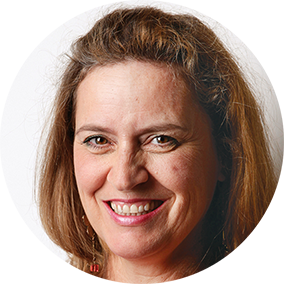 She has also taken part in scientific committees of Greek and international conferences and has been a reviewer for international scientific journals. Her passion for cooking is yet to find its way out to the public. She has taken part in tasting events with aromatic and pharmaceutical plants organized by the Balkan Botanic Garden of Kroussia. She is an honorary member of the Association of Medicinal and Aromatic Plants of Greece. She is married and has one girl. 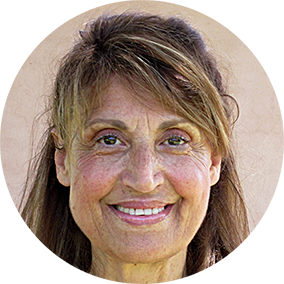 Dr Eleni Maloupa is an agronomist. She has graduated from the Aristotle University of Thessaloniki and had her PhD in Biology and Physiology of Plants in the Pierre et Marie Curie University in Paris. She is a full researcher at the Institute of Plant Breeding and Phytogenetic Resources of the Hellenic Agricultural Organization Dimitra and Headmistress of the Agricultural Production Institutes of Northern Greece. She is an honorary member of the Association of Medicinal and Aromatic Plants of Greece. Her research interests are primarily focused on the protection, conservation, propagation, cultivation and sustainable utilization of the diversity of Greek plants, with an emphasis on aromatic-pharmaceutical plants, floricultural and edible native plants of Greece. She is the instigator, creator and scientifically responsible both for the Balkan Botanic Garden of Kroussia (Pontokerasia, Kilkis Perfecture, Greece) and for the Laboratory for the Conservation and Exploitation of Native and Floricultural Species (Thermi, Thessaloniki, Greece). She is also a scientific advisor of the Botanic Garden of the Aegean (Chios Island, Greece) and the Botanic Garden of Kefalonia Island; she is the prime mover in the development of a Hellenic Botanic Garden Network. She is the national representative of Greece in the European Botanic Gardens Consortium (Botanic Gardens Conservation International, BGCI) and a member of the steering committee of the international conservation network PLANTA EUROPA. She has taught for several years at Alexander Technological Education Institute of Thessaloniki (ATEITH), at the University of Thessaly, at the Mediterranean Agronomic Institute of Chania (MAICH), as well as at the Aristotle University of Thessaloniki, School of Biology (in MSc level). Also she has taught at the American Farm School in Thessaloniki and at various Agricultural Centres or Centres of Vocational Training. Much of her research work has been published both in Greek and in international scientific journals and books. She has planned and carried out important scientific programmes in corporation with researchers of international recognition. She has implementing pilot programmes on new cultivations of native plants of Greece and their processing methods in corporation with groups of producers or Social Enterprises in various regions of Greece. 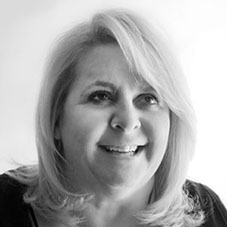 She has organised three international congresses as well as many other workshops and events. She has taken part in researches relevant to the sustainable exploitation of native Greek plants, in actions aiming to spread the research results and in programmes of environmental education. She was a member of several evaluation committees of academic institutions, of MSc and Doctoral theses, evaluations of researchers and academics as well as in scientific committees of Greek and international conferences. Also she has been a reviewer for international scientific journals. 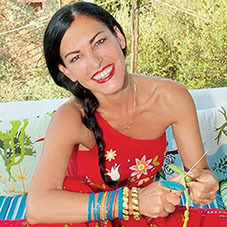 She has organized numerous tasting events on aromatic plants both for Greek and international scientific audiences along with Maria Stikoudi and other associates. Her family, friends and associates enjoy her passion for cooking and good Greek wine. Please read these Terms and Conditions (hereafter ‘Terms’) carefully before using the website http://www.aromagardenbook.gr (‘Service’). Your access to and use of the Service is conditioned on your acceptance of and compliance with these Terms. These Terms apply to all visitors and users who access or use the Service. By accessing or using the Service you agree to be bound by these Terms. If you disagree with any part of the terms then you may not access the Service. Our website Service does not allow you to post, link, store, share and otherwise make available certain information, text, graphics, videos, or other material related to the book ("Content"). 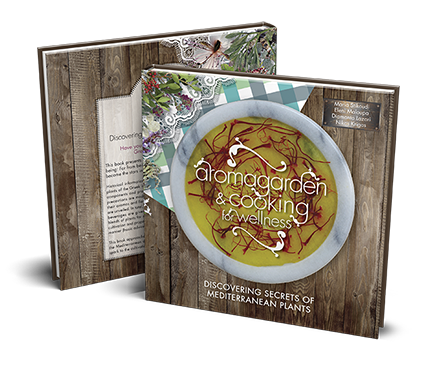 However, you can do so in the book’s profile in our facebook page ‘Aromagarden & Cooking for Wellness’. We reserve the right, at our sole discretion, to modify or replace these Terms at any time. What constitutes a material change will be determined at our sole discretion. Our Service may contain links to third-party web sites or services that are not owned or controlled by the Aromagardenbook web site. The web site Aromagardenbook has no control over, and assumes no responsibility for, the content, privacy policies, or practices of any third-party web sites or services. You further acknowledge and agree that Aromagardenbook web site shall not be responsible or liable, directly or indirectly, for any damage or loss caused or alleged to be caused by or in connection with use of or reliance on any such content, goods or services available on or through any such web sites or services. We strongly advise you to read the terms and conditions and privacy policies of any third-party web sites or services that you visit through our web site. If you wish to buy the book made available through the Service (‘Purchase’), you may be asked to supply certain information relevant to your Purchase including, without limitation, your given and last name, e-mail, phone number and address. By placing an order, you confirm that you are at least 18 years of age and that all information you provide is accurate, complete and not misleading. You agree to deal with us in good faith and in compliance with all applicable laws. Once you submit an order, you cannot cancel it. All orders are subject to acceptance by us, at our discretion. We may cancel orders where we consider that you have not dealt with us in good faith or have otherwise breached applicable laws, even if the order has been confirmed. All prices of the book are in Euros (€) and include free shipping with DHL services (different charges are applied depending on the region of origin of the recipient of the book). Most orders within Greece should arrive at the next business day; orders within Europe (except Greece), Turkey, USA, Canada, Mexico and Russian Federation should arrive within 1-3 business days; orders to other regions should arrive within 2-7 business days. It is your responsibility to inform us promptly if an order does not arrive in due time by emailing to info@aromagardenbook.gr. Once we learn an order has not arrived within a reasonable period, we will lodge an enquiry with the courier and advise you of any issues that are discovered. The full payment for your order (including both the book price and the applicable delivery charges) will be deducted upon receipt of the book by DHL services. To sign and pay for your item you will generally need to be available between 7:00 am and 5:00 pm to receive the delivery. This should be taken into account when choosing a delivery address (e.g. you can use your work address for delivery). If you do not answer when the courier tries to deliver your order, the courier will generally leave a card. You must then contact the courier directly to arrange re-delivery. Without limitation, we are not liable for any loss or damage as a result of you failing to contact our courier within the time specified in any “article awaiting collection” notice left by the courier at the time of delivery. The book ordered by you remains our property until you pay for it in full. If you receive the book in a damaged condition, you may decline receiving it. In this case, give back to the courier the damaged book and order a new one. Any risk of damage, loss or deterioration to the book passes to you on delivery in accordance with these Terms. Return of the book can be agreed after personal communication with email (info@aromagrdenbook.gr). If you change your mind, you should return the book within 2 working days after the date delivered by DHL; the original sales receipt should be present and the book must be in original condition as purchased. If you return the book to us in a situation that does not comply with the above requirements, we will return it back to you at your cost. You acknowledge and agree that in case of events or causes beyond our reasonable control we are excused from performing our supply and other obligations and will not be responsible for any delays where and so long as we are prevented from performing our obligations under these Terms. We will endeavour to notify you of any delay and its expected duration. If we are prevented from performing our obligations for longer than a reasonable time, we may select to cancel your order without further liability to you. These Terms shall be governed and construed in accordance with the laws of Greece, without regard to its conflict of law provisions. Our failure to enforce any right or provision of these Terms will not be considered a waiver of those rights. If any provision of these Terms is held to be invalid or unenforceable by a court, the remaining provisions of these Terms will still remain in effect. These Terms constitute the entire agreement between us regarding our Service, and supersede and replace any prior agreements we might have between us regarding the Service. If you have any questions about these Terms, please contact us (info@aromardenbook.gr).